In humans, the adult skull is normally made up of 28 bones. Except for the mandible, all of the bones of the skull are joined together by sutures, rigid articulations permitting very little movement. At birth, the human skull is made up of 45 separate bony elements. As growth occurs, many of these bony elements gradually fuse together into solid bone (for example, the frontal bones). The bones of the roof of the skull are initially separated by regions of dense connective tissue. At birth these regions are fibrous and moveable, necessary for birth and later growth. Larger regions of connective tissue, called fontanelles, occur where certain bony elements meet. As growth and ossification progress, the connective tissue of the fontanelles is invaded and replaced by bone. The posterior fontanelle usually closes by eight weeks, but the anterior fontanelle can remain up to eighteen months. When one or more sutures fuse prematurely, skull growth can be restricted perpendicular to the suture. If multiple sutures fuse while the brain is still increasing in size, intracranial pressure can increase. Primary craniosynostosis is believed to be a result of primary defect in the mesenchymal layer ossification in the cranial bones. 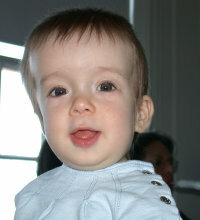 Secondary craniosynostosis is a result of primary failure of brain growth. 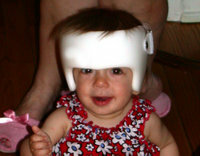 Surgery is typically used to seperate the fused sutures of the skull as well as to reshape the skull. Without surgery, blindness and mental retardation is a typical outcome. To treat the cosmetic troubles, a combination of orthodontic and orthognathic surgery can be used to relieve some of the midface deficiency. Typical surgery begins with a zigzag incision from ear to ear across the top of the head. The scar left by this type of incision makes the hair look more natural than that left by a straight incision would. Raney clips are typically used to curtail bleeding, as cauterization would not result in an aesthetically pleasing result upon healing. Once the scalp is peeled back, pilot holes are drilled through the skull. These pilot holes are then connected, separating the skull into several pieces. Once reshaped, these pieces are placed back on the head (typically in an altered configuration) and held together by a combination of dissolving sutures, plates, and screws. These plates and screws are typically composed of a copolymer comprised of polyglycolic and polylactic acid and will break down into water and carbon dioxide within a year. Demineralized bone matrix is often used to fill gaps left by the expanded skull. Once the Raney clips are removed, dissolving sutures are again used to close the incision.